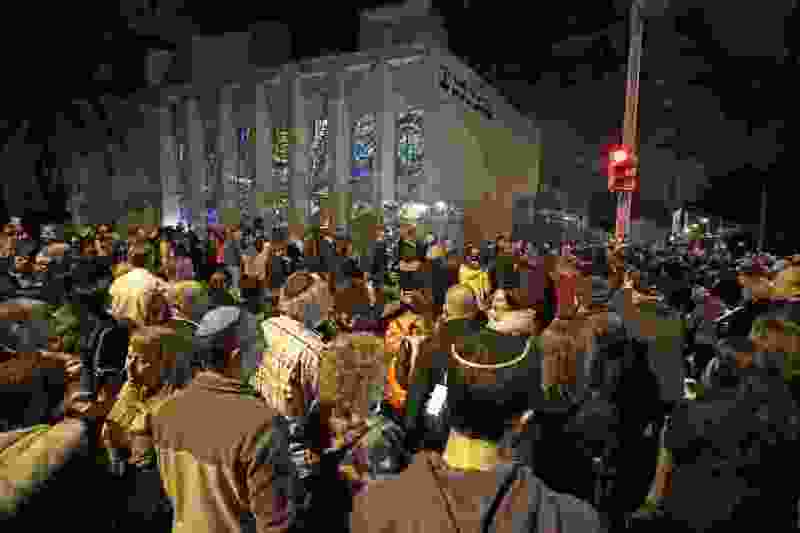 (AP Photo/Gene J. Puskar) Rabbi Jeffrey Myers leads a gathering in Hanukkah songs after lighting a menorah outside the Tree of Life Synagogue on the first night of Hanukkah, Sunday, Dec. 2, 2018, in the Squirrel Hill neighborhood of Pittsburgh. After losing her mother-in-law in last October’s Pittsburgh massacre, Marnie Fienberg quit her job. For a dozen years before the shooting, Fienberg and her mother-in-law, Joyce, had prepared the meal at the heart of the holiday together. Joyce Fienberg was used to cooking the seder meal — a ritual reenactment of the story of the Israelites’ exodus from Egypt — for as many as 25 guests. She always made matzo ball soup, sometimes three kinds — her regular recipe, a heartier whole-wheat version, and a gluten-free version. This year, Marnie Fienberg will do Passover differently. She has envisioned an ambitious project called “2 for Seder” that has caught on as a way to overcome anti-Semitism by better acquainting non-Jews with the Passover story of the biblical flight from slavery to freedom.